You can’t say I’ve led you astray. I’ve been completely honest about this: I am afraid of color. I can handle a little color. Four rooms in my house are painted a shade of yellow (five are a shade of beige). I wore a bold red shirt this week (under a navy hoodie). 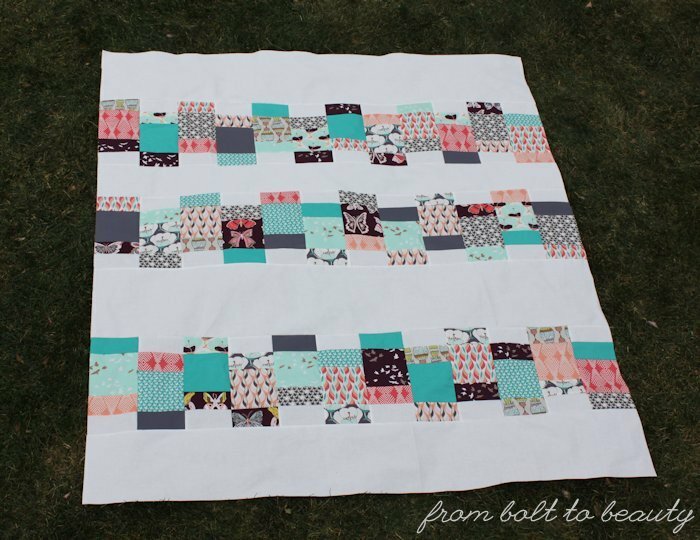 When it comes to my quilts, this tendency translates into slabs of white and negative space. 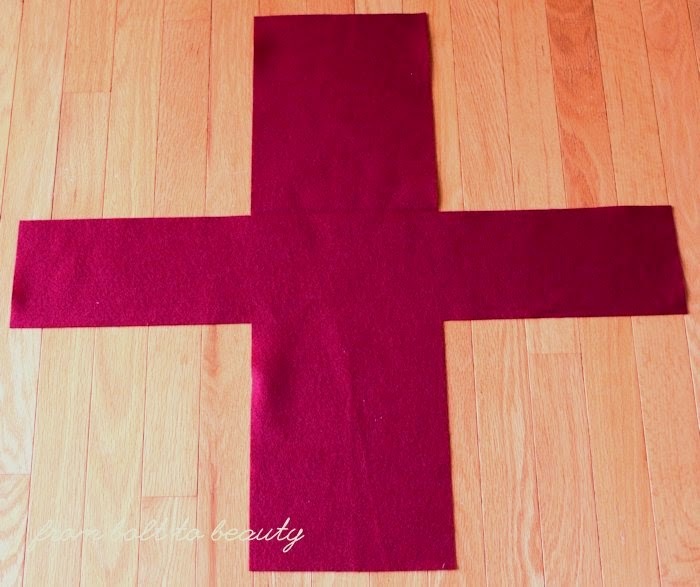 My preferred fabric to achieve this result? Some Kona Snow, please. 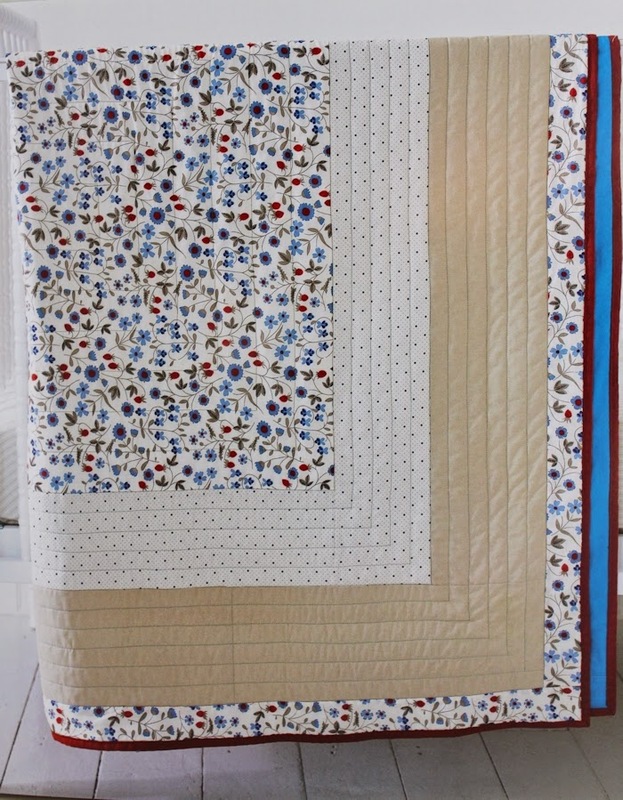 In the end, I decided to split the five pieced rows between the quilt top and backing instead of following the pattern. The top features three rows broken up by chunks of Kona Snow. 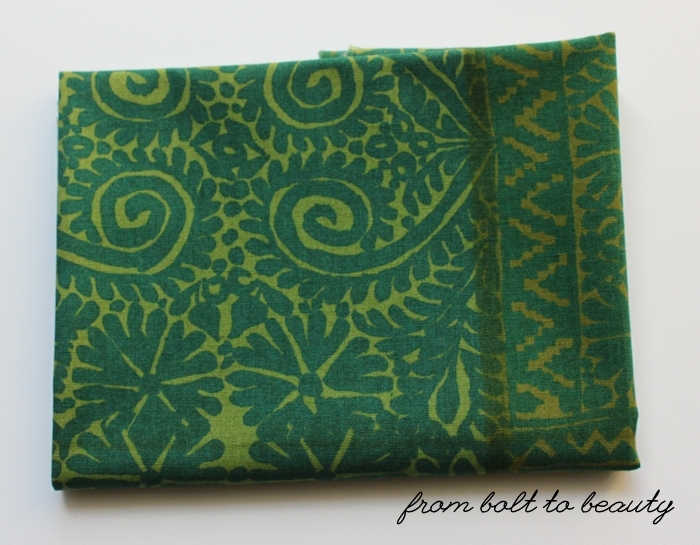 The back highlights the remaining two rows sashed with Kona Sage. 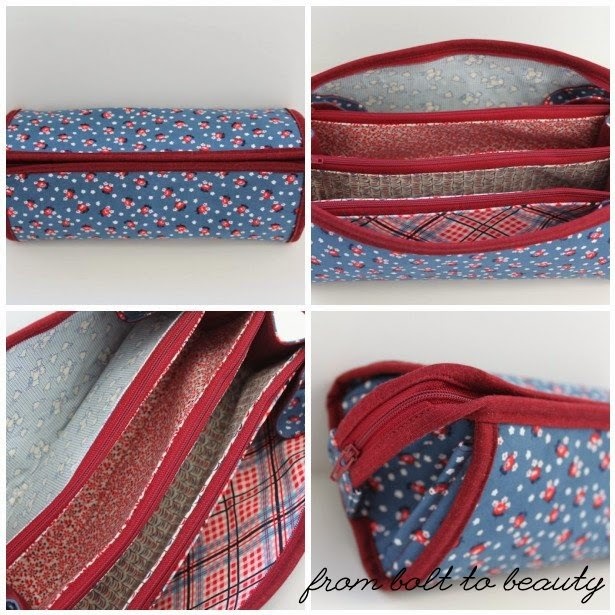 To celebrate the release of this pattern, Cheryl is giving away a PDF version of Looking Glass to one From Bolt to Beauty reader (my first giveaway!). 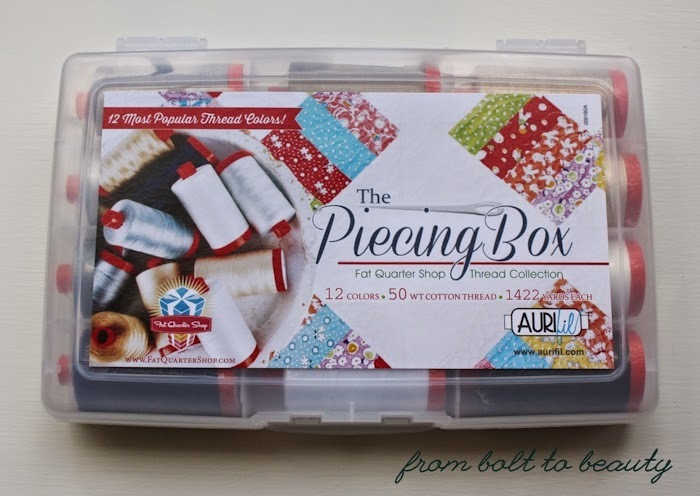 To enter, include a comment on this post, sharing with us your top sewing or quilting priority at the moment. If you’re a no-reply blogger, please include your email address so I can contact you if you win. This giveaway will remain open through Monday, December 1. I’ll post the winner here on my blog and contact him or her via email on Tuesday, December 2. Update: The giveaway is closed. The winner is mfhagopian. Congratulations! My stint as a knitter was illustrious but brief. I loved making scarves and baby hats and even more scarves. My arms, however, couldn’t keep up with all the repetitive motions. After more doctor appointments than I can now remember, I had to acquiesce: I wasn’t a knitter after all. My friend Miss C has had the opposite experience. 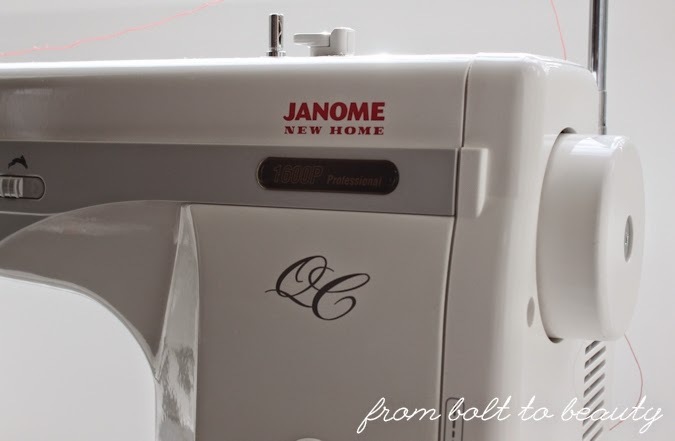 As an art-school graduate and graphic designer, this lady knows her way around a sewing machine. Her arms are on board but her heart isn’t: she’d rather knit and pearl than thread her vintage Singer any day. Miss C and I, we make a good pair. She welcomes my knitting and graphic-design needs and knows where to go when she wants something sewn. 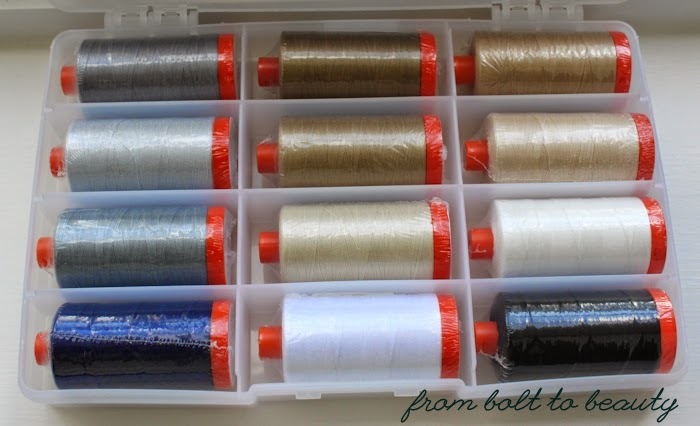 So far in the bargain, I’ve received a fancy-pants header for my blog as well as a big box of fabric-y goodness. 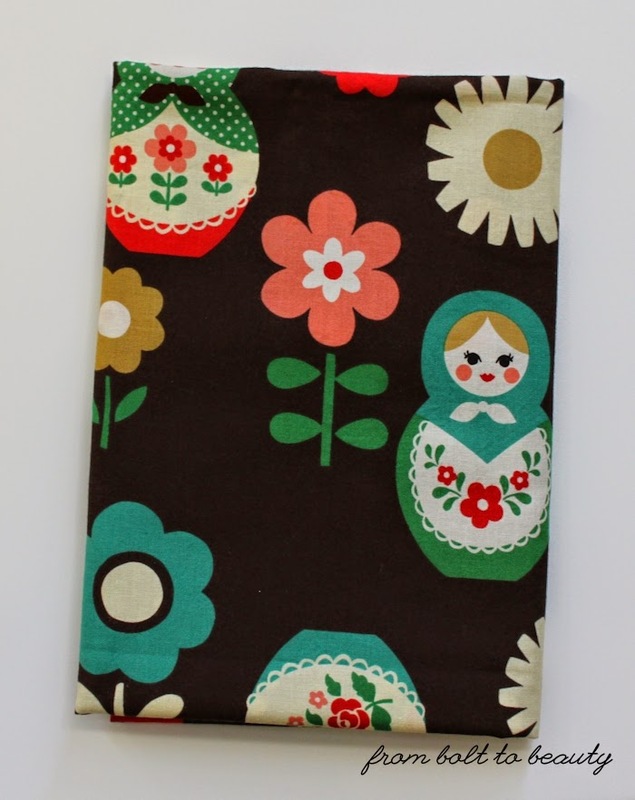 I will transform some of this, most notably the unidentified print with the Matryoshka dolls, into pillows for Miss C’s living room. But I have yet to determine the destinies of the rest of these older-but-still-beautiful fabrics. ... and this lovely unidentified green print. The real gold in this booty? Denyse Schmidt. There are three fat quarters of Katie Jump Rope, which I should have stockpiled by the bolt when it was released. I know I won’t cut into these anytime soon; I’ll visit them regularly in my stash cabinet, though. And there are 2 yards of Flea Market Fancy. I don’t know what to say about such a find—something so coveted and so large!—other than WOW. 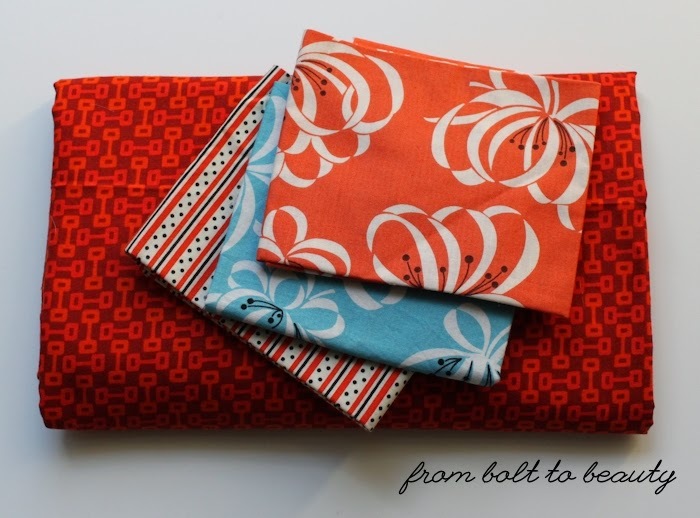 Rediscovering out-of-production fabric designs is like spending time with old friends. Man, it makes me happy. I have my sources other than Miss C, both online and brick and mortar, for older bolts. 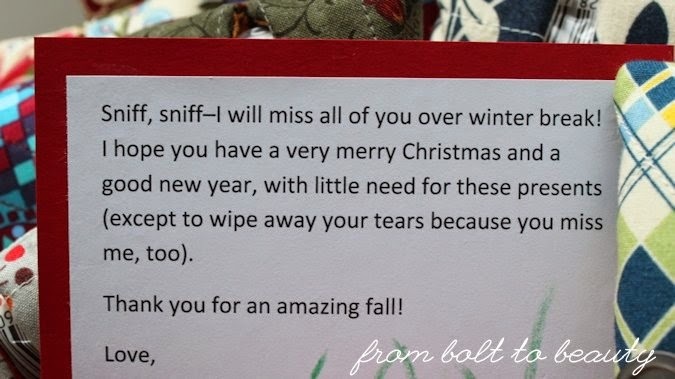 I’ve shown great self-control on that front of late—passing up on bolts of Tula Pink, Anna Maria Horner, and Denyse Schmidt—as my friend Sarah at Smiles Too Loudly can attest to. How about you? What oldies but goodies do you covet or have to buy when you encounter them? 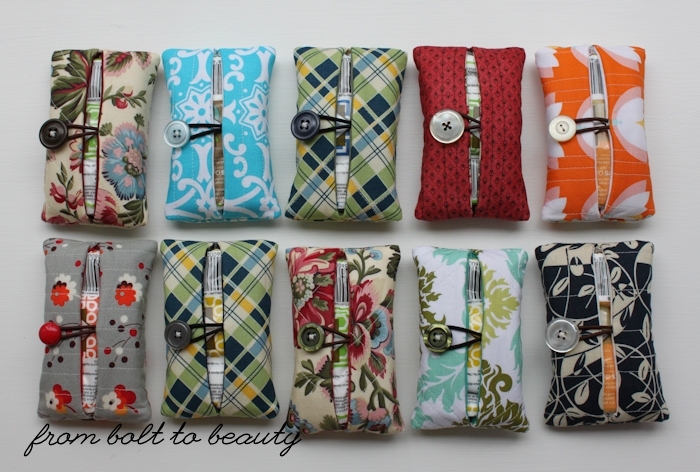 There are so many contests and sew-alongs in the quilty corner of the blogosphere. I often find it difficult in deciding what to participate in and what to let pass me by. It’s hard to say no to Le Challenge, however. 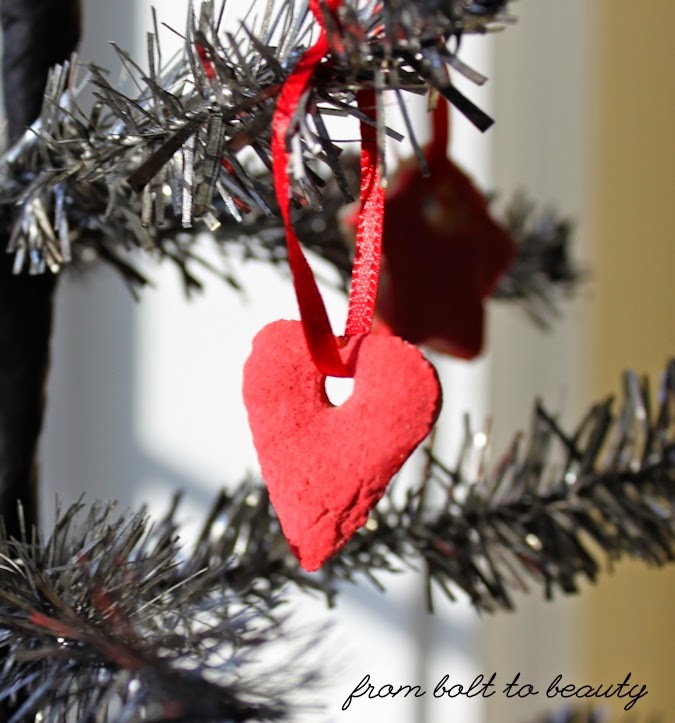 Each month, the creators of Le Challenge—Lucy of Charm About You and Nat of Made in Home—post a theme. Crafters then interpret that theme, sometimes in very different ways, and post a project in line with it the next month. Previous themes have included nature, charity, and small. I joined the party back in September, when the theme was era, and made a Rubik’s cube Christmas ornament. 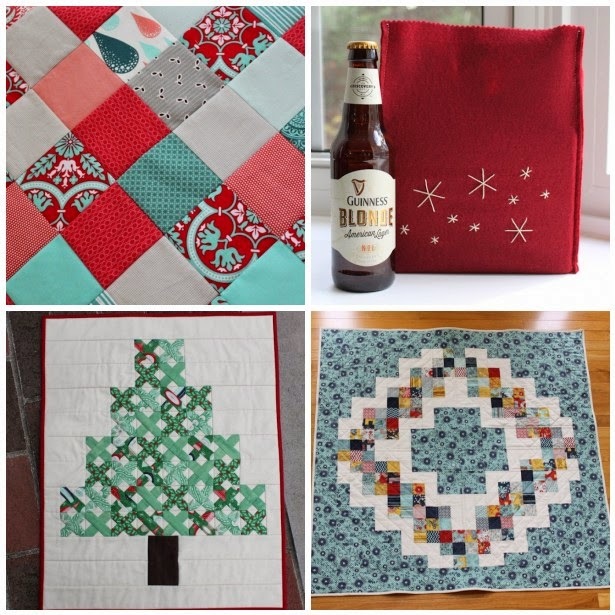 In October, the theme was mix, and I made a Christmas tree of cross-stitch blocks. (The tutorial is available here.) And then the theme for November was revealed: X. The beauty of that—for me!—was my October project fit the bill for November. 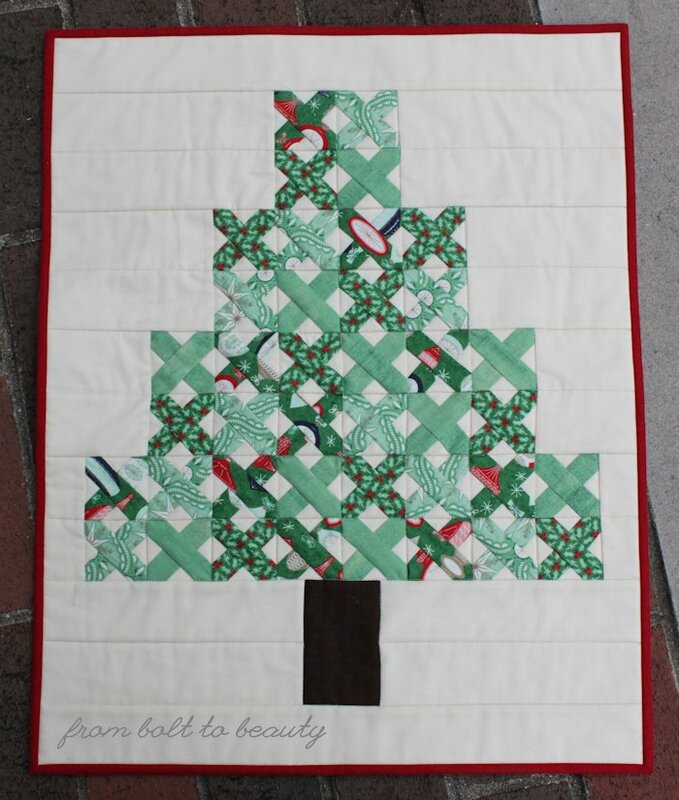 So I made another Christmas tree of cross-stitch blocks. The first one will be gifted. This second one is for me, me, me! I like working with the tiny 2½” cross-stitch blocks. My seams match up well, but my Xs are a bit off in places. I think that would bug me if the blocks were bigger. Somehow the dense patchwork of smaller squares seems more forgiving. I stitched in the ditch, as I did with my first tree. Admittedly, that part was a little annoying. 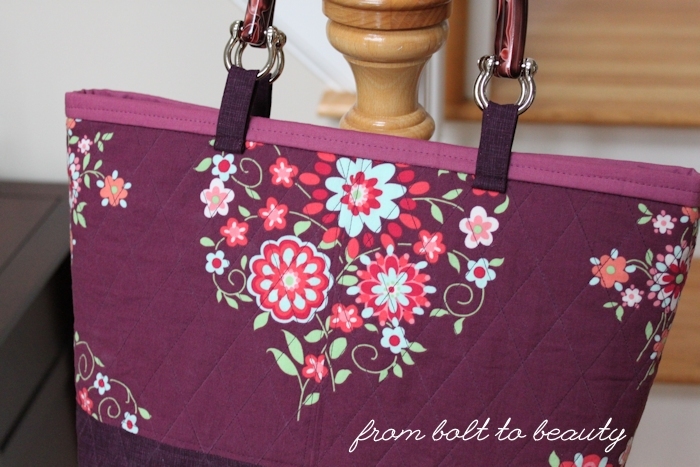 I like stitching in the ditch, but the seams in this project are bulky, and it shows in my quilting lines. 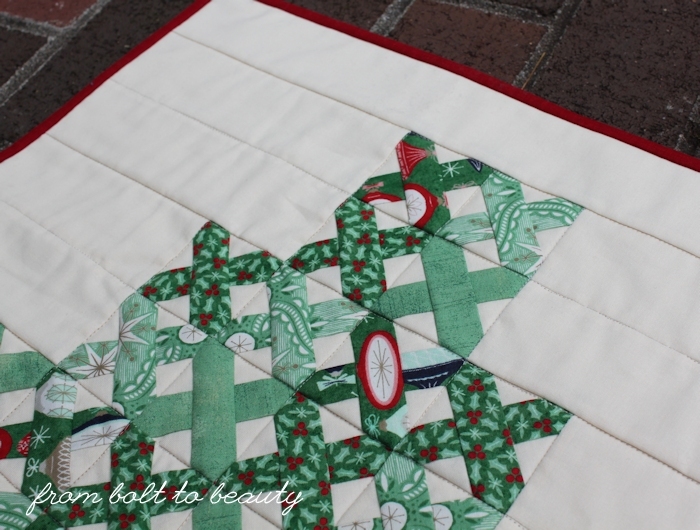 I still have a stack of cross-stitch blocks in Christmas fabrics waiting to be made into something. 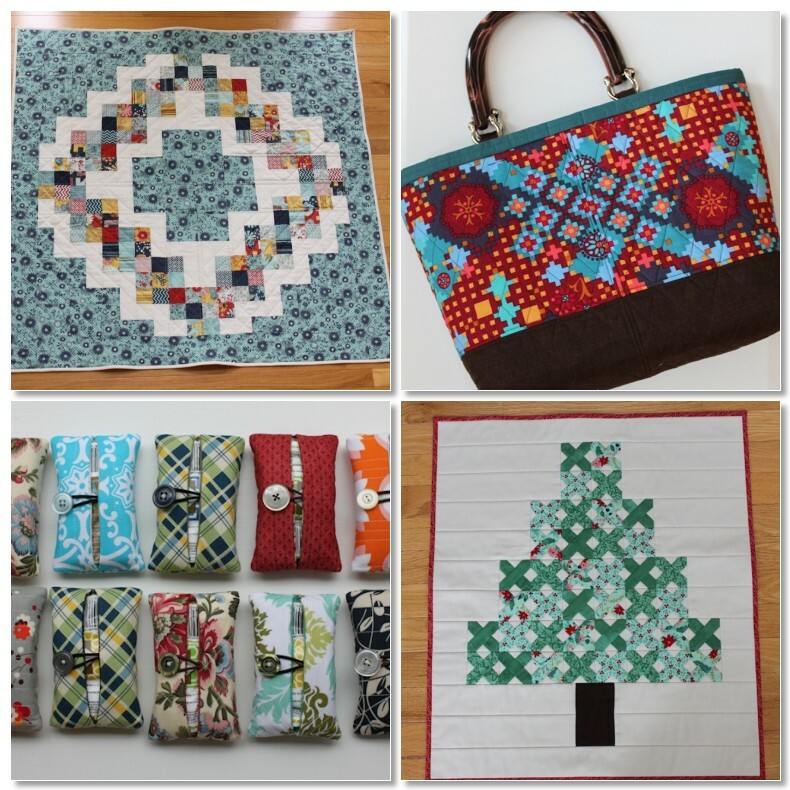 With two quilts to wrap up before Christmas 2014, I think those X’s will have to wait until Christmas 2015. 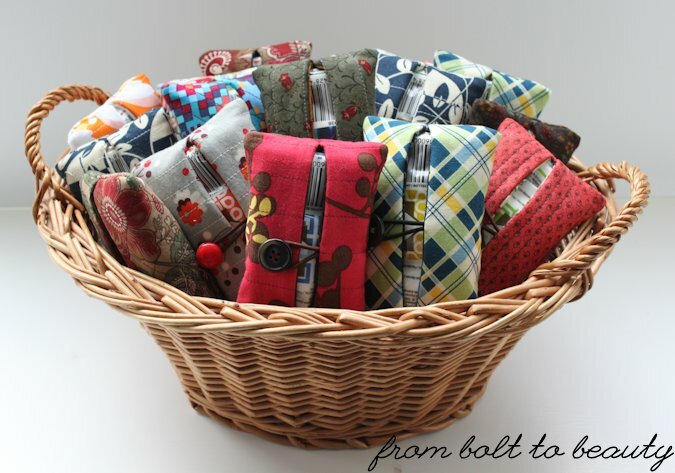 These are identical to the tissue cozies I made last month for myself and are based on this tutorial from Leland Ave Studios. Lucy and Nat have unveiled December’s theme: ink. I have zero idea what I might do for that. If you have a suggestion, I’m all ears. Share it in the comments below, or post it to the Le Challenge blog! Those projects were not conducive to establishing a stash because they often required at least a yard of a particular print. My selections at that time were haphazard. I bought what I liked and chose the amount to buy whimsically. 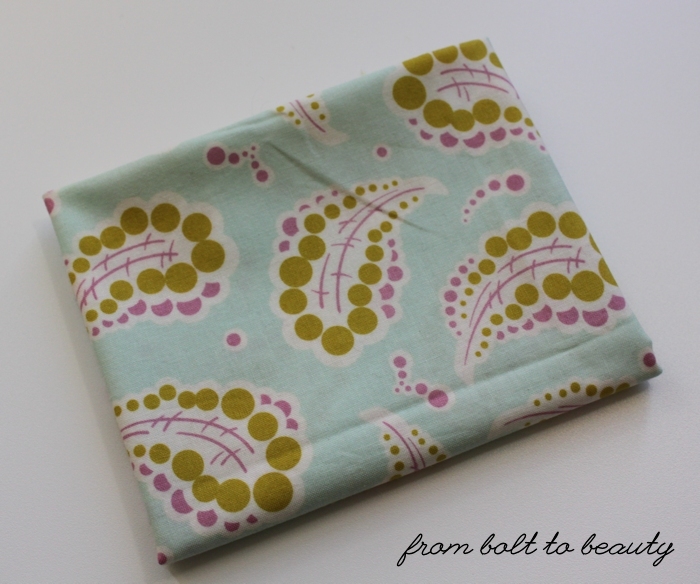 I even invested in fat quarters, which were not particularly helpful for the projects I was making. I still find myself today using some of those fats that were purchased six, seven, eight years ago. Now I’m a quilter and I’ve gotten smarter. 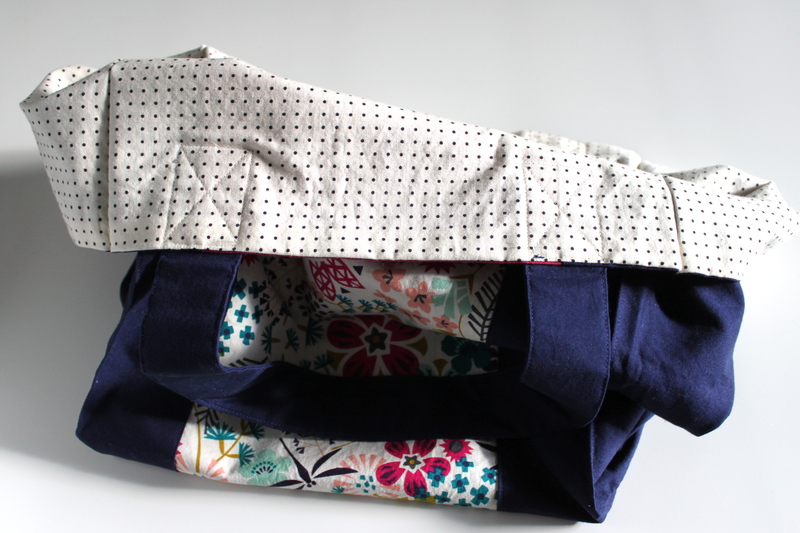 Fats are appealing, but I try not to stash them; half-yards work better for me and my projects. 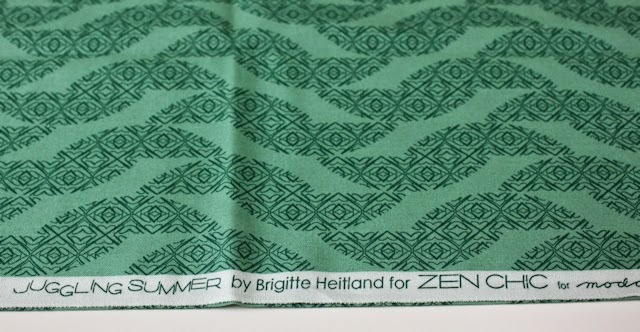 And although my stash contains many designs purchased only because I like them, I try to focus on almost-solids. They have a longevity that the latest and greatest can’t always offer. (I’m convinced that in 10 years we’re going to look back at our owl-adorned quilts and sewing projects and think, “What the heck? 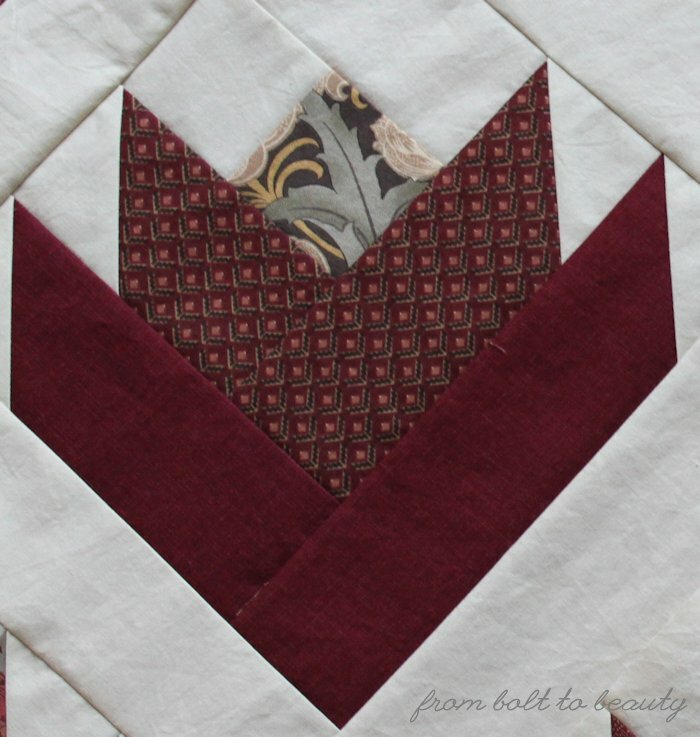 !”) I’d argue that those sensible almost-solids can also transform a good quilt into a great one, offering a visual interest that even the best solid can’t. 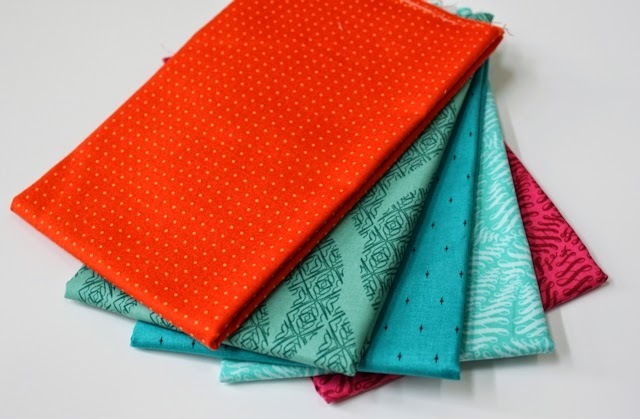 I put my stashing instincts to the test at Sew Fresh Fabrics’ going-out-of-business sale. 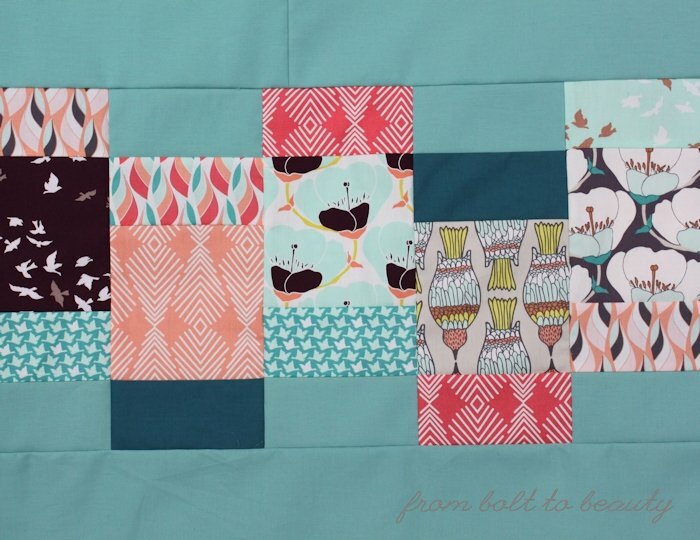 First up: oranges, aquas, and teals. I have been obsessed with these colors lately. 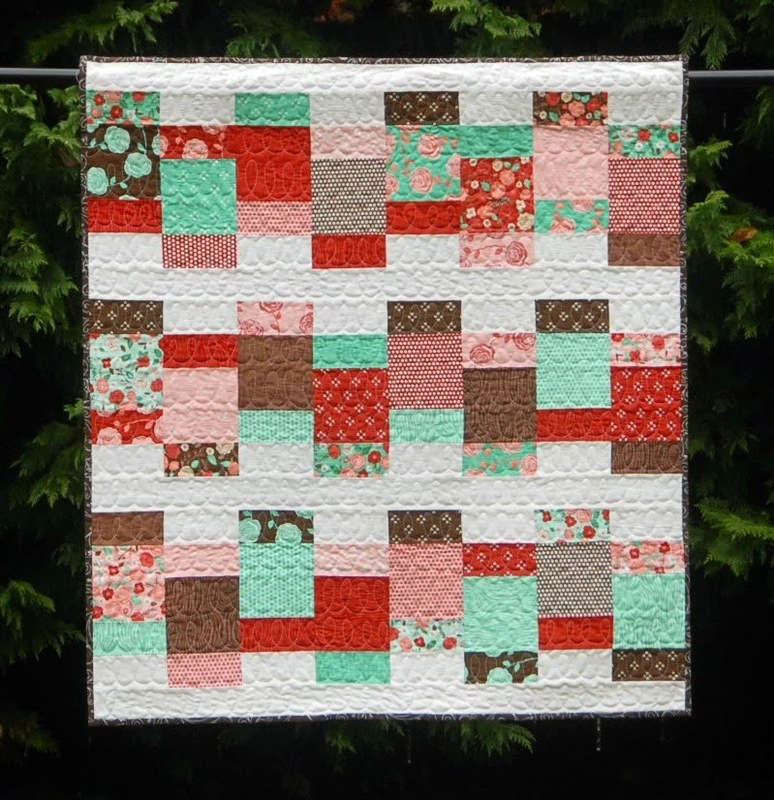 (Click here for a recent orange project, here for an aqua one, and here for a teal one.) From left to right, I scored selections from Comma by Zen Chic, Juggling Summer by Zen Chic, Acacia by Tula Pink, and Fox Field by Tula Pink. Actually, I like Tula’s scribbles so much that I got the hot-pink colorway, too. 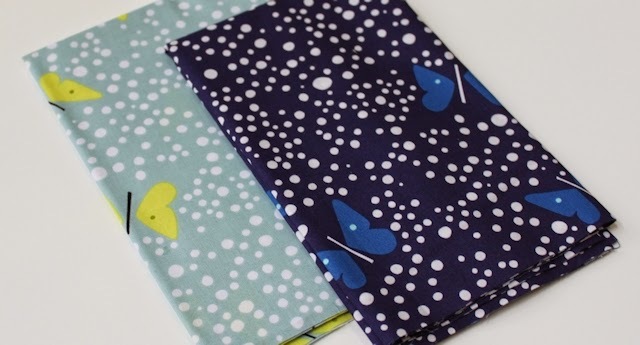 My favorite is the fabric from Juggling Summer. Eep—I adore this and wish I had bought a full yard! I also purchased Lizzy House’s butterflies in two different colorways, convinced that they’ll soon disappear from store shelves. Little did I know that Andover plans to release that design in a slew of new colorways next spring. Woo hoo! These two pretties will soon have some sisters. How about you? 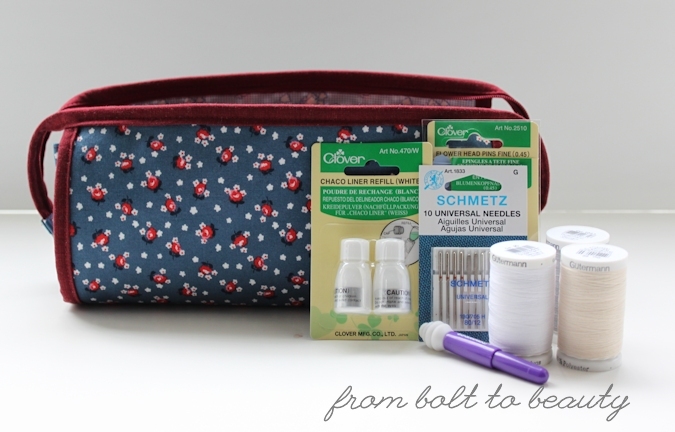 What is your stashing strategy, or are you one of those disciplined quilters with a slim stash? If you’re like me, you have at least one occasion each holiday season to thank a friend for his or her hospitality with a bottle of wine. 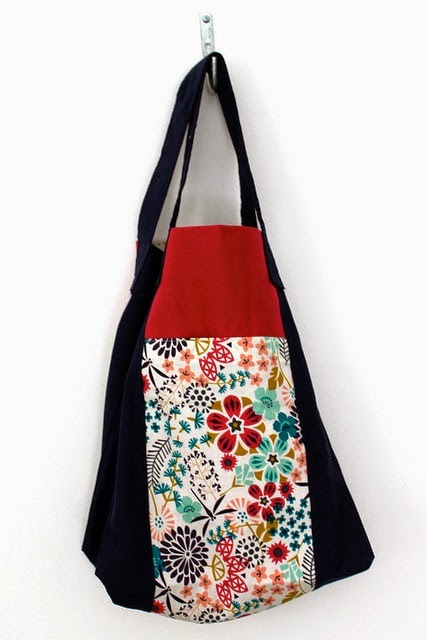 And if you’re like me, you think that the addition of a handmade bag elevates that gift to a new level. 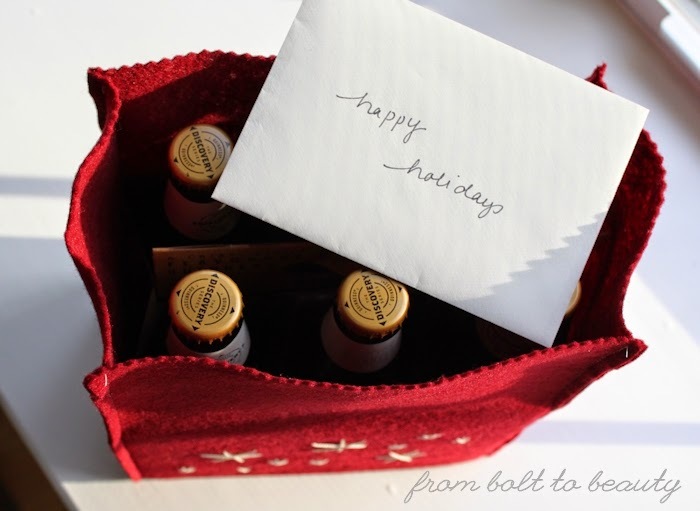 And just because you’re toting beer instead of wine doesn’t mean you have to skip the handmade gift wrap. 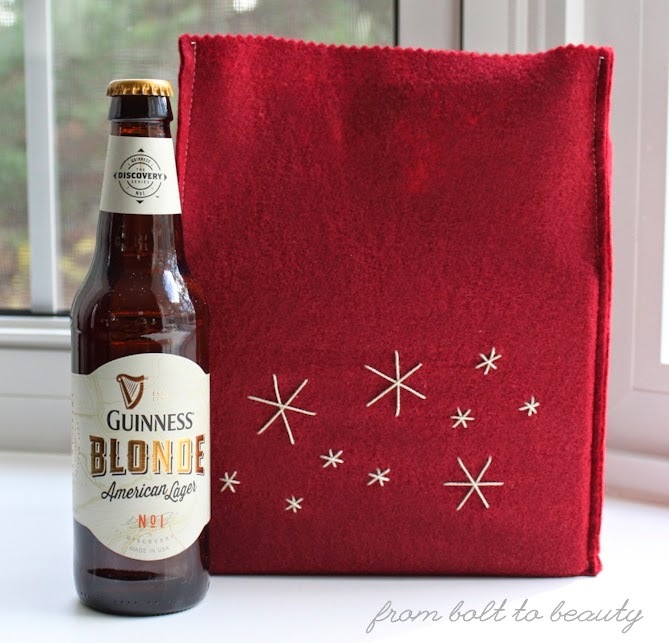 Using felt and a little pearl cotton, you can make a gift bag for the beer lovers in your life. In fact, you will probably spend more time making your beer selection than you will whipping up this project. These instructions are for a beer carrier whose bottom dimensions are 7½” x 5” (from my research, this is a standard size). Pink the very tip of each side with your pinking shears. 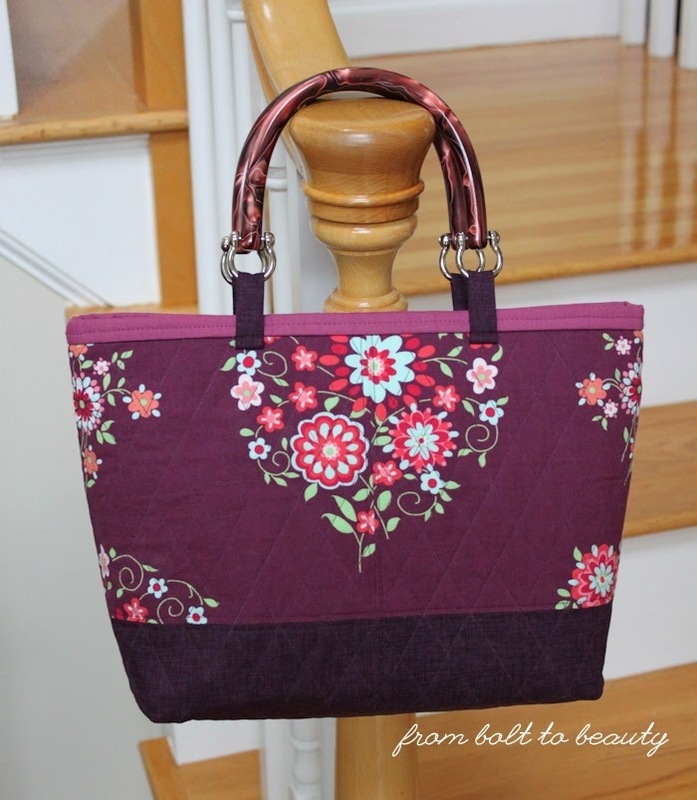 Embellish the bag as you desire. I free-handed snowflakes in pearl cotton on one of the long sides of the gift bag. I made sure to embellish away from the yet-to-be-sewn sides, to ensure my embroidery wouldn’t later end up in the seam allowance. 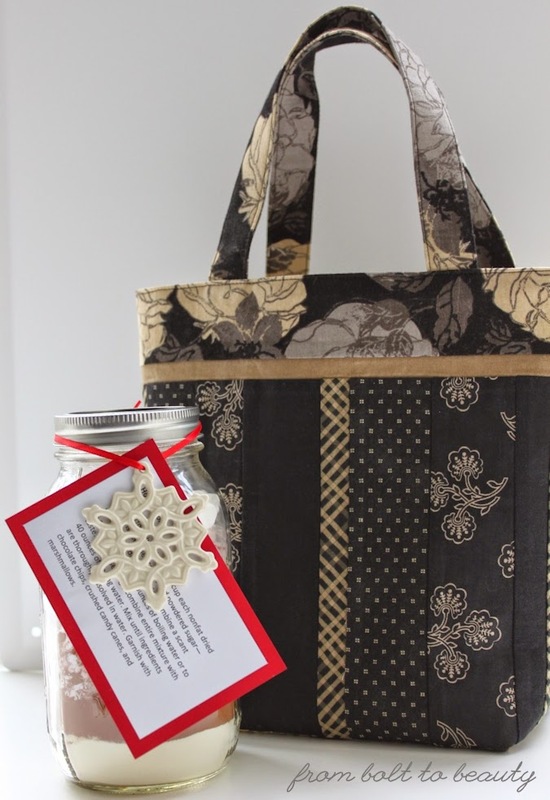 The sides of my beer carrier are 5½” tall; I made sure to place my snowflakes so that the wrong side of the embroidery wouldn’t be visible when the beer carrier was inside the gift bag. 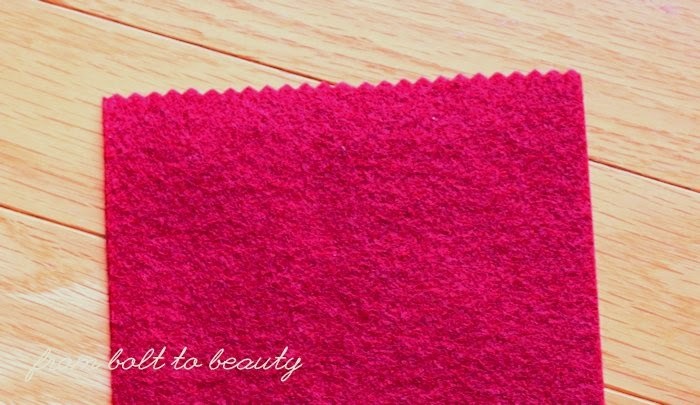 Now, using thread in a contrasting color, sew the side seams together. To do this, match the top edges of two adjacent sides with the wrong sides together and pin. 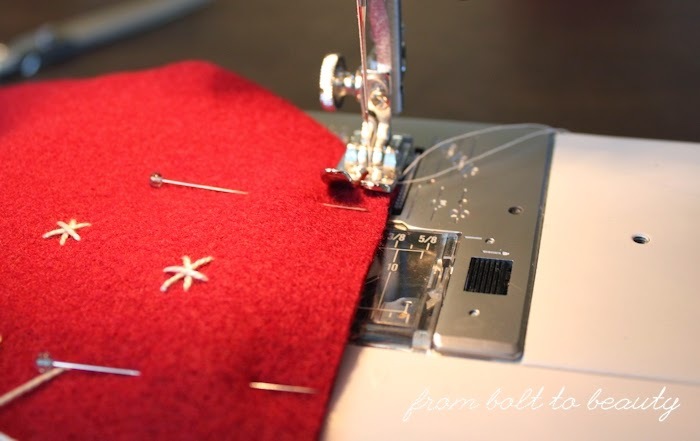 Start sewing a ¼” seam at the bottom corner and work your way out to the top, back-stitching at both ends. (I think a longer stitch length looks best on this project.) Repeat until all four seams are sewn. Insert your six-pack of beer (the weight of the bottles will help you here). The beer carrier will fit very snuggly in the felt gift bag. This is by design: the tight fit allows you to carry the beer by the handle without losing the gift bag.